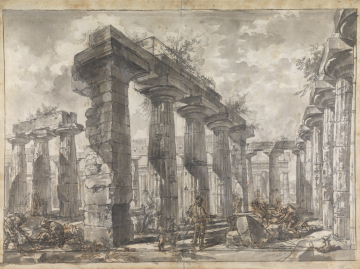 Soane displayed his group of 15 original Piranesi drawings for Paestum in his Picture Room, but not together. They were hung interspersed with other works: oil paintings, prints and watercolours. A number were positioned high up close to the skylights and exposed to the full effect of sunlight (Soane had blinds fitted to the lantern lights but these were removed at some point after his death). In the late 1980s the then Curator Peter Thornton placed the entire group together behind the north planes in the Picture Room, to protect them from the light. However, when the original 1837 hang was reinstated in the Picture Room in 2011-12 the decision was taken to replace all 15 drawings with facsimiles, in the original frames, in order to preserve the drawings whilst honouring Soane's wishes. This original drawing is now accessible in the Research Library at the Museum whilst the facsimile can be seen in the Picture Room.